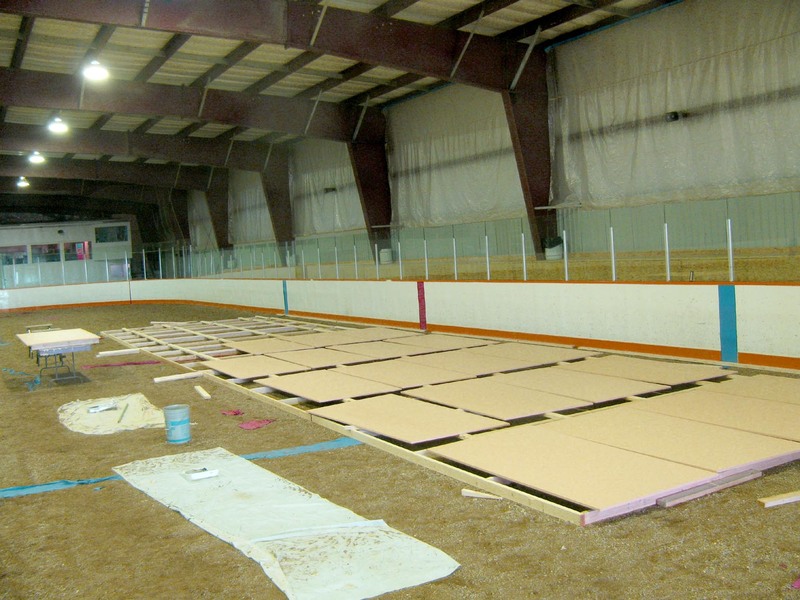 Material management and co-ordination is the key factor at this stage of the project, especially since fifty-two four foot by eight foot panels are required. One side of every panel is designated the 'good side' while the reverse is stamped 'back only'. With fifty-two panels to manage, you can imagine that it would be important to always know which side is the good one. Every panel weighs about eighty pounds, so it's wise to handle and move them as little as humanly possible. I think Sherwin and I succeeded in this, as we primed and positioned thirty-six panels on our first day of painting. We made an executive decision to leave the frames on the floor to serve double-duty as drying racks for the panels. After the temporary frame was designed and built yesterday, we decided that they would work well as drying racks for the fifty-two panels if we left them lying on the floor. It was a great idea and worked well, speeding up the process. Efficiency, don't you know? A huge space to work in is an absolute necessity for a project of this scale. As I was working today, I took a minute to reflect on what a GREAT studio the Community of Young has provided for this project. I also felt waves of gratitude wash over me that the universe has sent such a capable and enthusiastic assistant in such a timely manner. Sharon just happened to ask Sherwin and his partner Poppy (originally from Young) if they could think of a person who might make a good 'helper' to get the physically difficult parts underway. Sherwin immediately piped up and said, "Pick me." And here we are, in the thick of it! Creature comforts are a vital part of a hard working man's day. We make sure to take regular breaks during the work day. Nothing rejuvenates like a stiff cuppa java and some home-made cookies. Seeing as how we will be here for between ten and twelve weeks, we're bringing in some of the comforts of home. No point in roughing it too much. Great care is taken in the application of an opaque primer coat on the surface of the 3/4" 'Cresone' aka painters' panel. We decided at the outset that only one of us (that would be me) would be responsible for the paint application. I have about one-hundred thousand hours experience operating a roller cage so I got elected to take charge. By a unanimous vote. 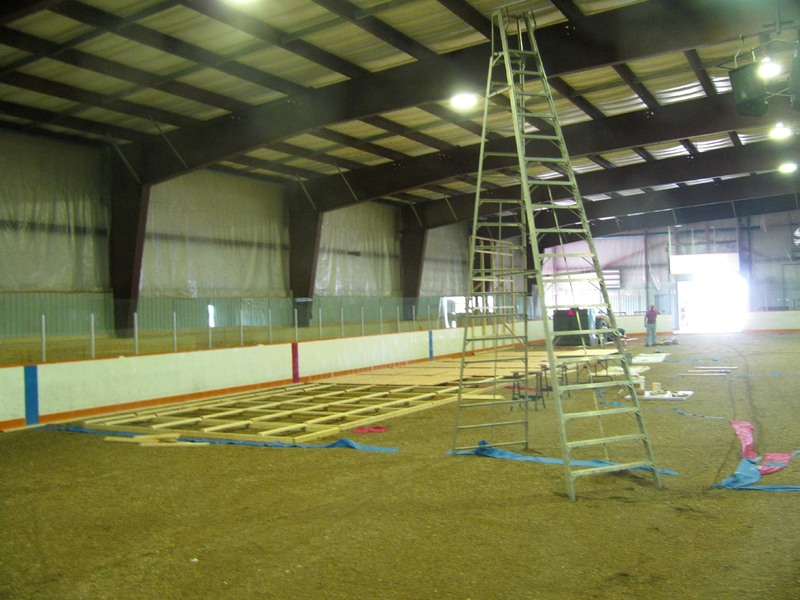 TLC is fastidiously invested in ensuring a well sealed outer edge of every panel. Getting all of the factory edges very well sealed and primed is extremely important, as they are the most vulnerable to migratory water. 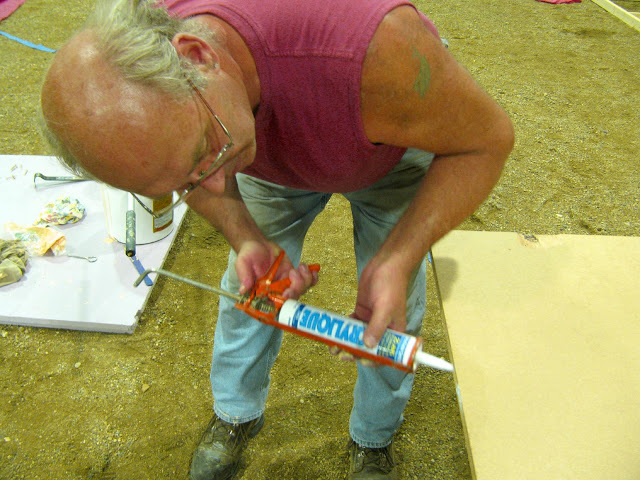 With this in mind, we decided to hit any tiny (or not so tiny) voids in the perimeter edges with a paintable silicone sealant prior to priming with the professional grade 100% acrylic latex. Rule of thumb: buy the most expensive brand of high quality paint for the best results. 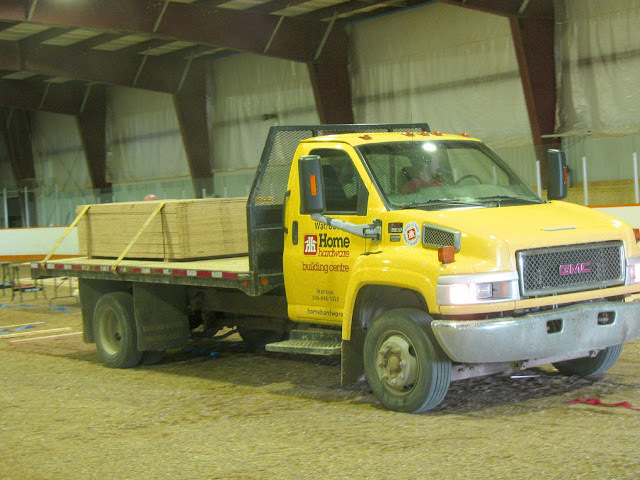 Our local lumber yard delivers a second load of the high-quality painters' panels right on schedule. 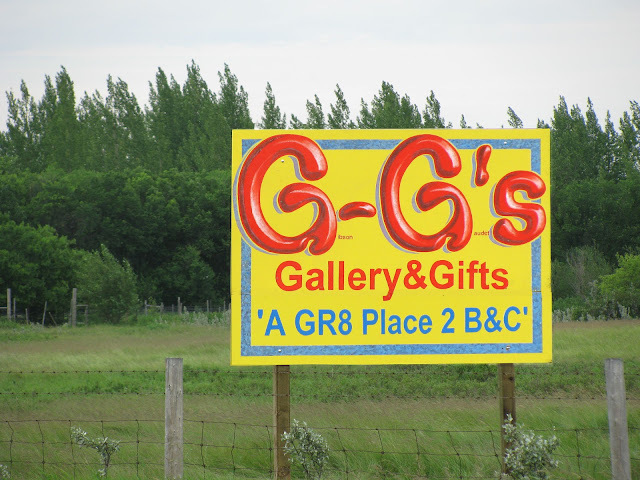 One (of many) huge advantages in the location of this project and site is its proximity to the Town of Watrous and of course Manitou Beach, where Sherwin and I live respectively. Our friends at Watrous Home-All made their second material delivery to the rink today just like clockwork. 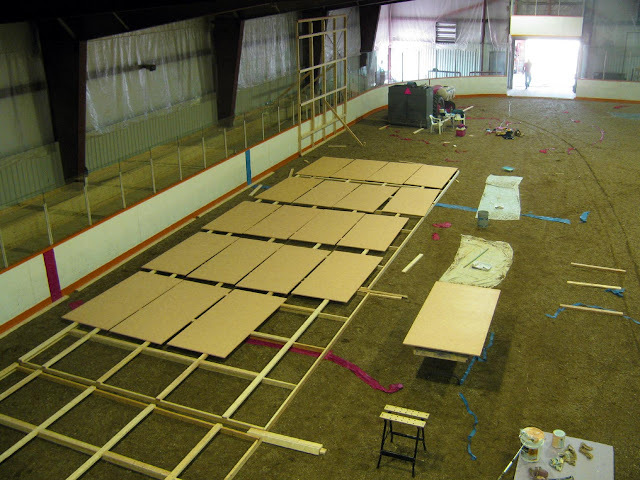 We had just finished priming and sealing the first batch of twenty panels and had had a lunch break when the truck pulled in with another load of the balance: thirty-two more panels for a total of fifty-two. 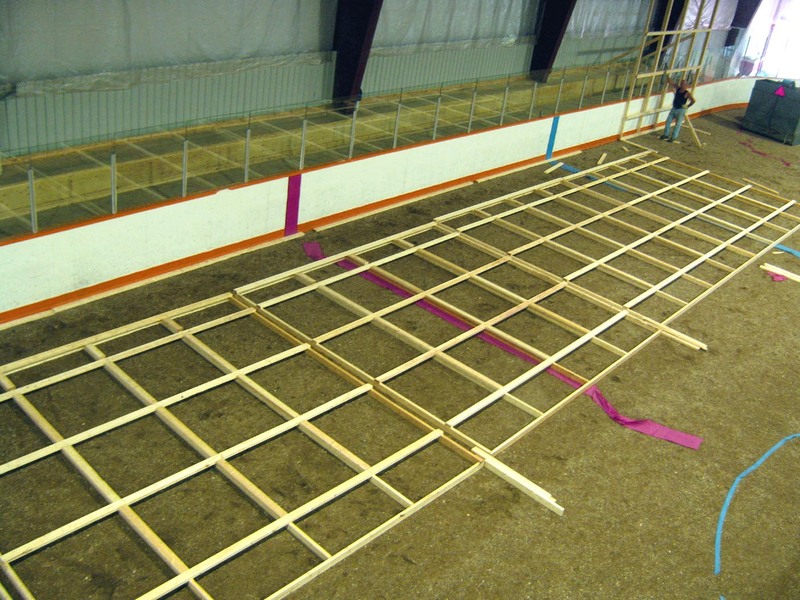 Swallow-eye's view of the immense make-shift studio with the first twenty panels drying. It is definitely starting to sink in that this a big project when I see this aerial shot of less than half of the panels drying on their make-shift racks. I am thinking that 'forever YOUNG' will qualify for the designation 'World's Largest Free-Standing Mural' by a country freakin' mile. Just putting it out there...I am claiming that title until I hear any different. 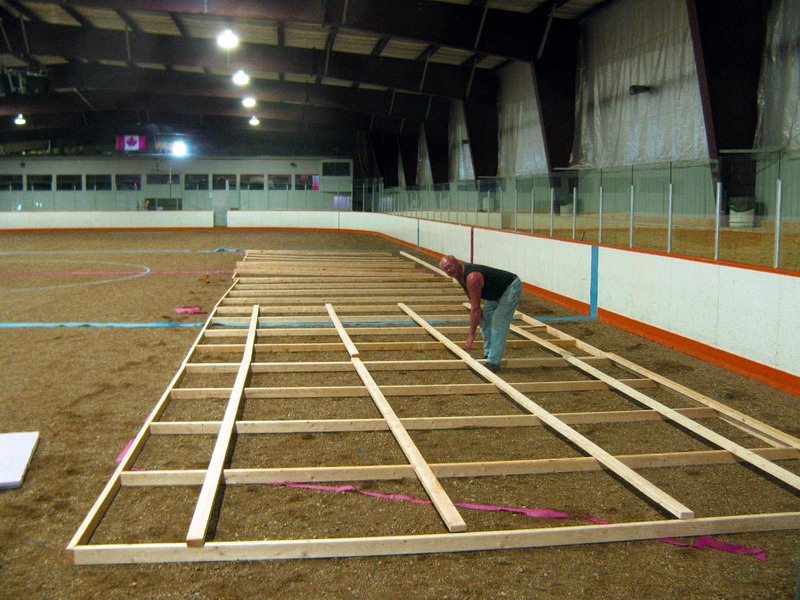 After an intense first day of construction, the temporary frame for the massive (and I don't use that word lightly) is well underway. Now that the project is just beginning to physically materialize, I am beginning to appreciate that this will require some super-human endurance and focus to complete within our time-frame. But you know what? After I finished my last large mural at Sacred Heart Chaldean Catholic Church in Saskatoon, I declared to myself, "Self, there is no project too large after this." 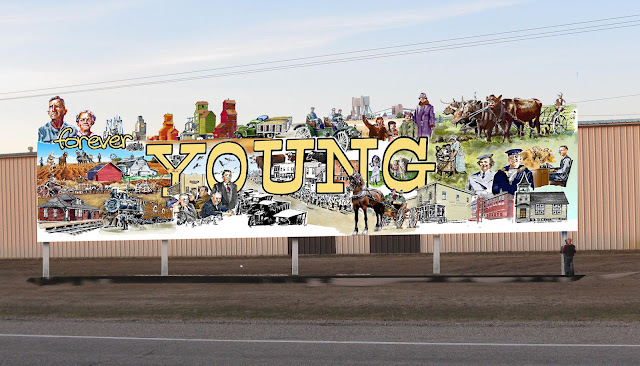 Well, I don't want to start an argument with myself, but this mural project at Young is a truly formidable undertaking. If this doesn't put mural-painting on the map in this locale, then I will re-draw the freaking map! 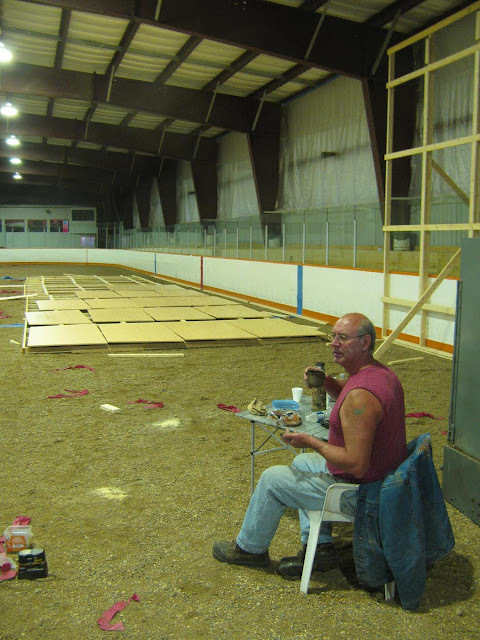 My extremely able-bodied assistant Sherwin Peterson...a Viking giant...engaged in laying out the partial frame on the floor of our work-space in Young; the local hockey rink. In order to proceed with this over-size monstrosity, it is necessary to first construct a temporary frame on which to hang the fifty-two four foot by eight foot panels. A big part of a project on this scale is material management and co-ordination. While there are certain things that can be done to for efficiency, there is no getting around the fact that the total weight of the panels alone will exceed three thousand pounds. 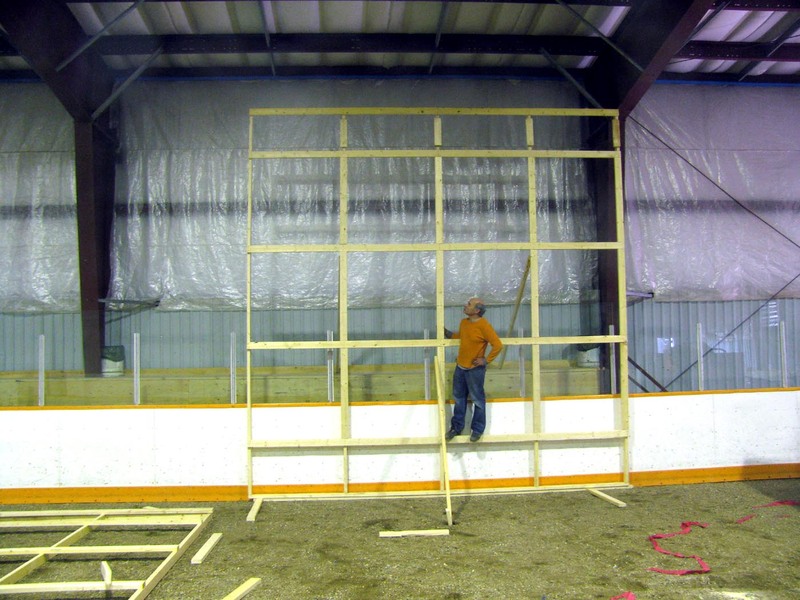 In order to ensure zero tolerance registration from panel to panel they must be affixed to a frame aka huge stud wall inside the shop. Once the panels are actually painted- a far off dream at the moment- they will be systematically transferred to their permanent steel frame outside. See that man the size of a bug in the upper right-hand corner? Gives you an idea of the rather imposing scale. In fact, this sixteen foot by eighty-four foot frame represents just the bottom two-thirds of the mural. As you see from my computer-generated mock-up, there are numerous appendages that will soar above the roof-line of the arena to present against the clear blue sky. I am a big proponent of breaking out of the regular rectangle for added visual dynamism. This is me wondering, "What have I gotten myself into?" After the first section of frame was erected I decided to climb up for a photo. This sixteen by sixteen foot section represents a mere ten percent of the overall mural. Am I frightened? No, not really...just very excited to get on with it. Stay tuned for regular updates in this space that will chronicle every step of this project from construction to painting through to its completion and ultimately the official unveiling in the fall of 2012. This might be a good time for you to subscribe to this blog, as I will be posting at least once a week. You don't want to miss this. One big advantage of being a 'master of several trades' is that I am assigned to the sign-painting department aka developing the visual continuity of our logo and color theme. The word 'advantage' is used in this instance because it would cost a small fortune if we had to job all of this out. PLUS, it is a sheer pleasure to focus creative juices on our own baby, Gibson-Gaudet's Gallery & Gifts...affectionately known as 'G-G's Gallery & Gifts'. The very first coat of red over the yellow base. Don't ask me why, but I decided to chronicle the evolution of the red 'G' from its first coat of red against a bright yellow backdrop. 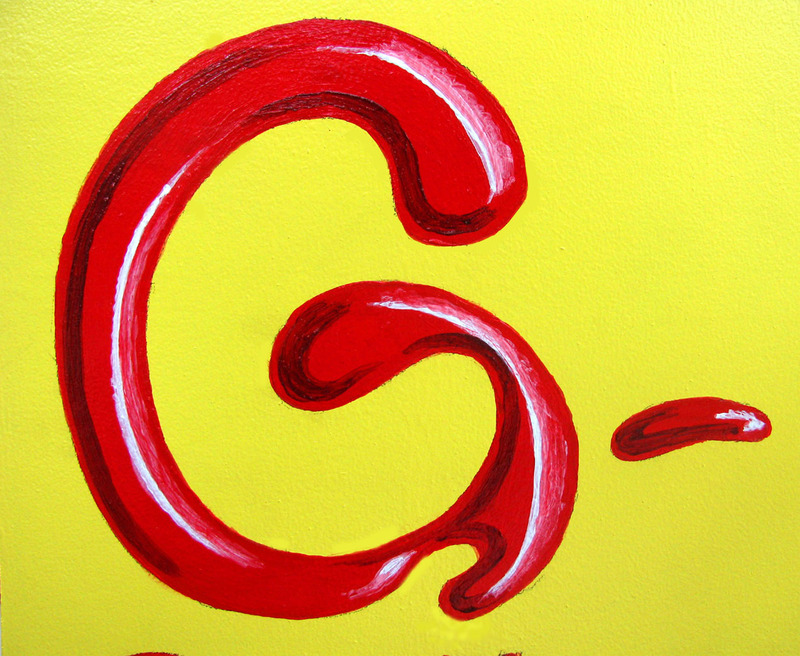 Yellow is a comfortable, homey color...even friendly, while red is outgoing and looking for a gr8 time. Increasing the intensity with another coat. I figured, if I don't photograph this process as I go, it will be a process that is lost forever. Literally, as each successive layer gets buried as they build up. 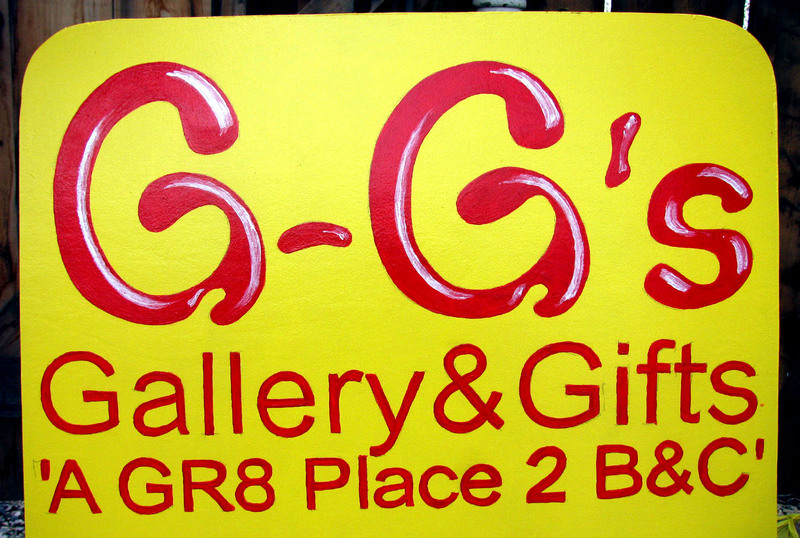 Just for the heck of it, I ran for my camera after the first coat and kept it handy to see the red 'G's' through to completion. Introducing highlights to suggest a beveled edge. I like the idea of mimicking a three-dimensional, really shiny surface like poured resin, or carved ruby...polished to a bright sheen. This dresses up the 'G's to make them outstanding in contrast with the other flat rendered text and plain - but friendly- yellow backdrop. The beveled effect is enhanced with the addition of shadowy bits. Once the shadows are introduced-with consideration to a constant light source- the 3-dimensional, extra-shiny look kicks in. 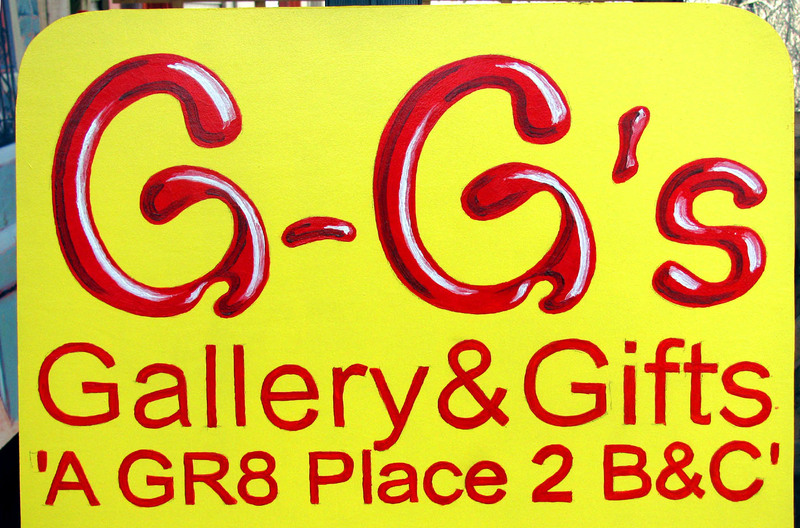 Finally, after painting in the sunshine the effect of a raised, liquidey bright, clear ruby red is suggested. 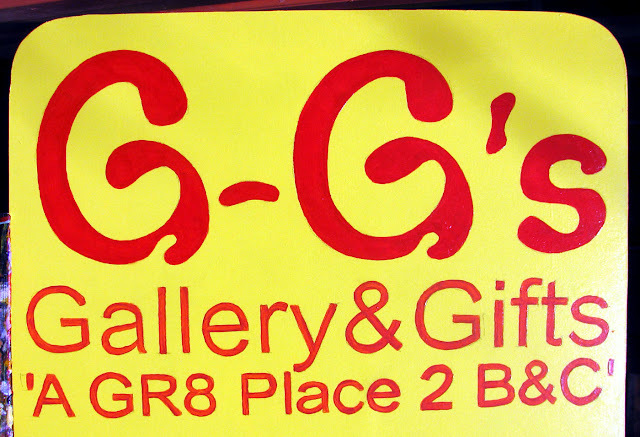 A fairly delicate blending of translucent glazes finishes the 'G's of the G-G's logo to an eye-catching polish. 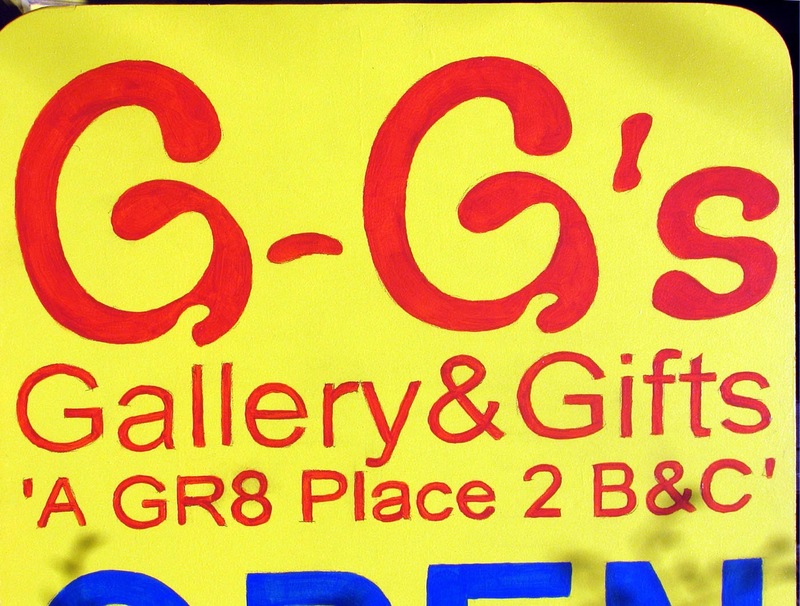 In every instance, there is a concerted effort to accentuate the three-dimensional effect of the signature 'G-G's' as seen on the large sign just south of Manitou Beach on highway #365. This rendering appears consistently throughout the graphic application of the logo...there's that graphic continuity thing again. When I invited the committee members to take a sneak peek at the mural 'Imaginary Landscape', I was surprised and impressed that they articulated a rather subtle objection to my treatment of the 'sunset' motif in the third panel. To refresh your memory, this mural was commissioned to grace a wall of the new ecumenical chapel being constructed as an element of the new Manitou Seniors' Lodge as an adjunct to the Watrous Union Hospital. The concept was to come up with a design that would be evocative of a life journey with an uplifting ambiance. It was laid out very clearly that the image must not include any overt religious symbolism but rather, it must only suggest a certain emotional framework with the use of such abstract qualities as color, mood and atmosphere. My initial reaction to this fairly open-ended criteria was to suggest three panels be used as the main motif...to suggest a feeling of transition or progression from one state of being to another. 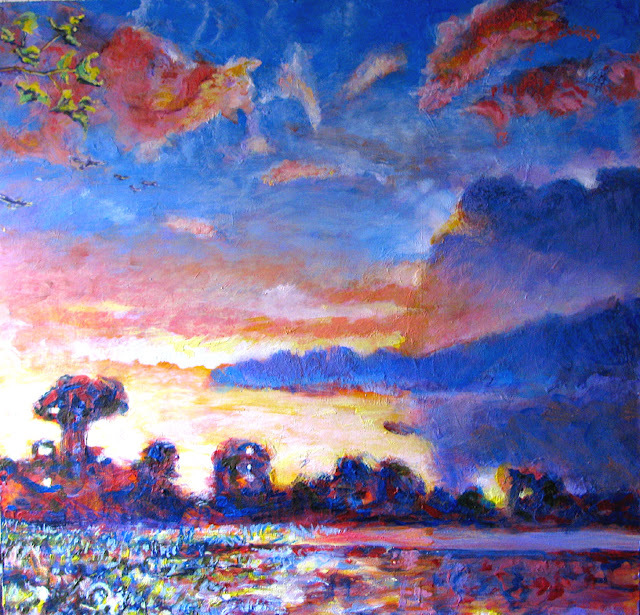 Later, I decided to use images of tree, a path, water, sky and light. The third panel was a bit too foreboding. It was brought to my attention that the 'dark cloud' at the extreme right-hand side of the panel was perhaps a little too dark and foreboding. Was there any chance that I could peel back the cloud a bit to reveal more of the splendid light? One of the committee members is a Christian Pastor and he explained to me that he intended to use the mural as a talking point to council bereaved families. He pointed out that though the image was deliberately non-religious, he nevertheless wished to refer to the artwork in his work with grieving families...and that he needed something in the mural to offer a sense of hope and serenity to his delivery. I was very intrigued to hear him explain how his work with grieving families would spin out of my artwork. Even more compelling were his pleas for a more revealing glimpse of the 'light'. Fascinating! Though it was not my explicit intention, the interpretation of the purple cloud was in fact the 'veil of death' by the committee members. The committee members expressed concern and regret that they felt it necessary to intervene when at the outset they had in fact granted me 'Carte Blanche' with the design...within a certain sensibility relating to the space in which the work was destined to hang. I, on the other hand, welcomed their input and said as much. I found the idea that they could perceive so acutely the subtle symbolic nuances of the piece a testament to the visceral power of visual art to stir up the emotions. I was happy to meet their concerns -so diplomatically framed- by repainting that section of sky to introduce more light and to have this light reflecting more brilliantly on the water below. But I was not about to show the shining sun...as it would be getting too close to symbolizing the Face of the Godhead. Which is something I am not willing to do, as I feel it is quite preposterous and impossible. 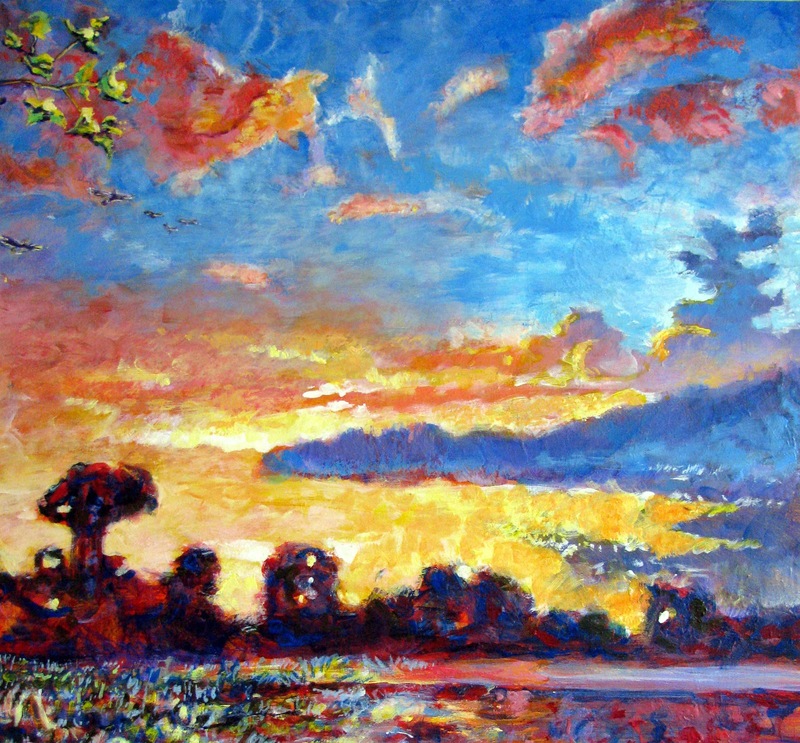 Reworked version of the third panel shows a more brilliant sky with its attendant sparkles on the surface of the water. A more brilliant, promising sky. While I was only too happy to make the modification, I could only go so far with it. The face of the sun remains hidden and obscured by the remnant of the great purple 'veil of death'. I am comfortable with the idea that the 'face of God' remain mysterious and un-knowable.